Before they set off on some new adventure, mountaineers do at least know the height of their target. Writers are mountaineers who set off with far less certainty. Their imagined summit may not exist or be hidden in a fog of ideas, experiences and confusing signals. Having followed the gestation of ICF’s new publication, sensing the highs and lows of the writing team as they plotted their way forward, today’s publication moment comes, like childbirth, as a huge relief – and a cause for celebration. ICF – The Intelligent Community Forum – has garnered years of experience of progressive communities from around the world. This experience is now brought to bear on issues of the moment – how innovative cities create job growth in an age of disruption. In our full review we applaud their myth-busting analysis and demolition of orthodox views. This work underscores the need for a radical rethink of the priorities in planning for the growth of places and their people. With so much political capital invested in the power of competition, the evidence shows very clearly that in our more-networked world ‘collaborative advantage’ is the new ‘competitive advantage’. 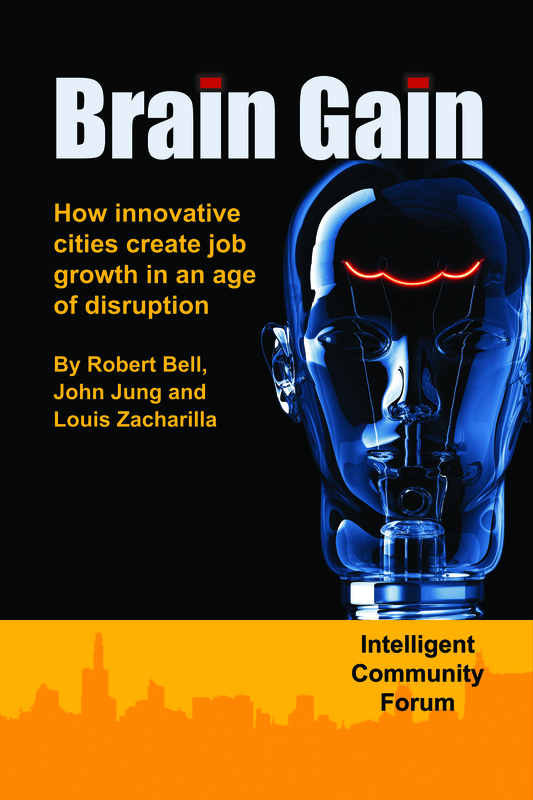 Read the Groupe Intellex review, ‘Brain Gain: community responses to digital disruption‘.